SmartNews Pro Tip: Save it for Later | SmartNews, Inc.
SmartNews is focused on today’s news. Because of this the app is optimized for showing you the most important stories of the moment. The idea is to get you up to speed on what’s going on and then on with your day. If we do our job well there, the thinking goes, you’ll be back. That said, there are times when you’re glancing at the latest headlines and you run across a meaty profile in Vanity Fair or a lengthy speech transcript in Medium. I’ve seen comments in the App Store where people are looking for a way to save articles for later. There are a couple of options that I’d like to share. 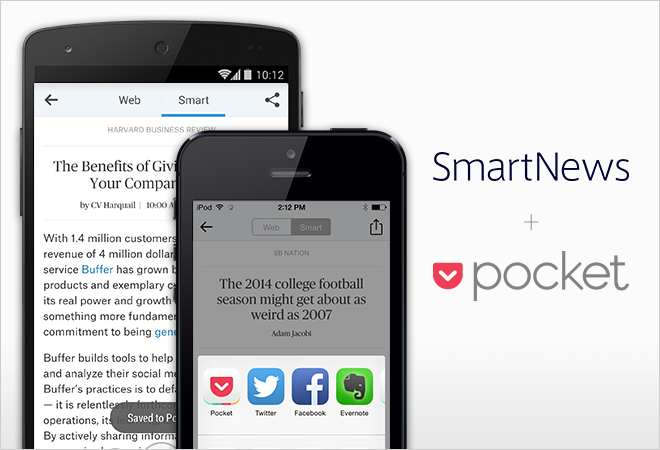 SmartNews is integrated with Pocket. Create an account at Pocket or login with your existing one. When you share from the article page on SmartNews (another pro tip, a long press on any headline will go directly to the save menu), you have the option to Save to Pocket. Once you’ve saved it here you can go back to Pocket on the Web and read the full text of the article later. If you upgrade to Pocket Premium, they will even download, index, and archive the full text of anything you save to Pocket making later retrieval easier. Pocket recently added Text-to-Speech to their mobile app. I ride my bike to work so sometimes it’s better to have a long article read to me. This afternoon I listened to the transcript of Jennifer Granick’s excellent keynote at Black Hat 2015, The End of the Internet Dream which was posted on Medium. It somehow seemed appropriate to have the same voice that speaks to me as Siri explaining how important it is to keep the internet open and decentralized. Wait, where did that article go? Remember that great story you wanted to read in the morning, but didn’t have time and now it’s no longer there? We got your back. Scroll to the bottom of any tab other than Top and you’ll see a “Show more” link that will show you more articles in the channel. We can’t archive the entire Internet, but it’ll at least extend your horizon a few more hours if you want to dig in a little further or find an earlier article you misplaced. Got more tips and tricks? Let us know!